We often talk about poor quality maintenance where most emphasis put on either on price or lack of time, or both at the same time . Worn Porsche Tire. Click on the thumbnail for bigger photo. You can judge it by yourself, this poor Porsche has been badly neglected has been driven in with bold tires and a completely sucked in distorted poor quality oil filter. Probably the oil was also inferior quality as well. Note! Brand name tires, include factory installed tire on brand new Porsche have built in tire wear indicators. They are molded into the bottom of the tread grooves and will appear as approximately 1/2 in. 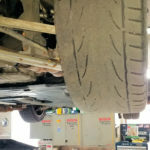 (12 mm) bands when the tire tread depth is down to 1/16 of an in (1.6 mm). When the indicators appear in two or more adjacent grooves, it is time to replace the tires. 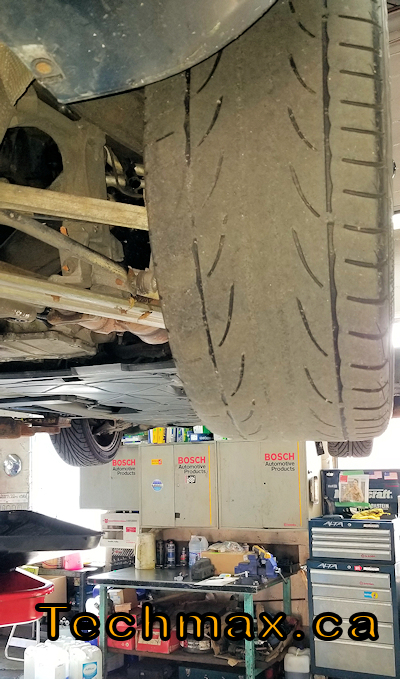 We recommend, however, that you do not let the tires wear down to the extent that you can see on the above photo at top left. Driving a high performance sport car, like a Porsche with worn tires, can result in loss of control of the vehicle and could cause serious personal injuries or death. 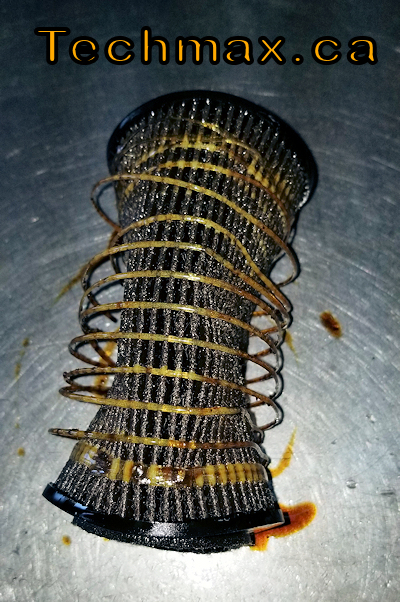 Collapsed Porsche Oil filter. Click on the thumbnail for bigger photo. Porsche engineers a magnificent car, engineering excellence is built into every Porsche model, with thousands of finely tuned and intricate parts working in harmony, but they need regular maintenance like most other cars. When you invest in a fine tuned high tech sports car wouldn’t make sense to give it the best care possible, ensuring your initial investment will last years to come reliably? The answer is clear, give it proper care by providing the best fuel, the best lubricant and German filters. Perform essential services on proven time and distance based by established specialist with the proper know how, as they were designed and intended by the respective manufacturers and engineers. Cutting corners will result in costly repairs and random brake downs inadvertently at will. 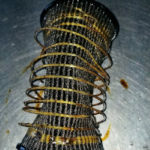 What all these numbers and letters means to your oil change? Located in Stuttgart Germany, Porsche Classic is a workshop dedicated to keeping rare and exotic Porsches working and on the road in their original form. 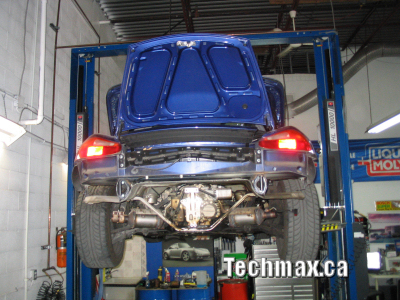 They have original Porsche parts and their costumers are from all over the world. With new O-2 sensors to protect it. Please keep in mind you must replace the regulating, front O/2 sensors to make the catalyst last and work at optimum efficiency. On todays modern engines things work together like a fine orchestra, if any of the instruments are out of tune the whole performance becomes un-enjoyable. 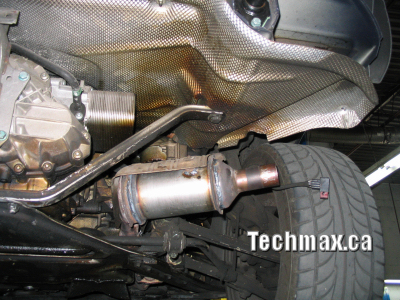 More info on Exhaust System. This is what it takes to replace the meltdown catalyst converter for Porsche Boxter. 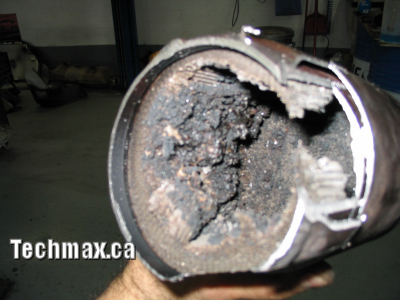 It can happen if your Boxter had a steady misfire or you never replaced the oxygen censor in time. We can make them in-house (you need two), this way considerably less expensive, alternative to the original Porsche component, and they do what they supposed to do. You can see on the next photo how the catalyst converter looked like, when we checked it. The above Porsche failed the emission test. I suspected a damaged catalyst. My guess was right on. This converter was in a really bad shape. Good thing the car was still in running condition.